The moment the identity of the newly elected 266th pontiff was revealed, it was clear to the thousands gathered in St. Peter’s Square, and to the watching world, that this pope was different in fascinating and exciting ways — the first from Latin America, the first Jesuit, and the first to take the name Francis, in honor of St. Francis of Assisi. Francis has repeatedly foregone the fancy dress, lavish accommodations, and other luxuries of his position, emphasizing pastoral work with the sick and the poor and always seeking to empower the underdog. 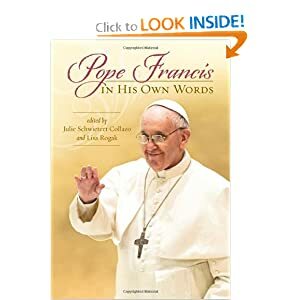 This revealing collection of his own words, gathered from sermons, interviews, and the Pope’s books, prompts understanding and insight into his way of being and believing — and inspires goodwill, love, and hope. The child has absolutely no responsibility for the state of his parents' marriage. Often a baptism can be a new start for the parents as well. In some churches--and I don't know how to remedy this, honestly--there is a fierce competition between bridesmaids and brides. These women aren't observing a religious act; they're just showing off. And this weighs on my conscience; as a priest, I am permitting this and I haven't found a way to put a stop to it. The most dangerous idols our own selves when we want to occupy the place of God. This post is linked to New Evangelists Monthly. Are Public School Really That Bad?